The BASIS Independent McLean MATHCOUNTS and JV History Bowl teams are the 2019 Virginia State Champions! This is the third year in a row (and third year competing) that the BIM MATHCOUNTS team has won the state competition. Brian L. ’23, Sam W. ’23, Max Y. ’24, and Ethan Z. ’23 made up this year’s MATHCOUNTS team. Sam and Ethan were on last year’s team. The team earned a spot to compete in the State Competition by winning the regional competition in February. The team is coached by Mr. Sullivan. In the individual events, Sam and Ethan finished in first and second place, respectively, which means they will compete as part of the Virginia State team at the 2019 Raytheon MATHCOUNTS National Competition. The state team is comprised on the top four state individual winners and is coached by the winning team’s coach; this year that is BIM’s coach Mr. Sullivan. The National Competition will be held in Orlando, Fla., on May 11-14. MATHCOUNTS will present the National Competition live via webcast on www.mathcounts.org on Monday, May 13 at 10:00 AM ET. Best of luck to Sam, Ethan, Mr. Sullivan, and the Virginia Team! 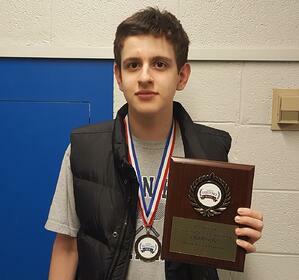 As a one-student BASIS Independent McLean team, Justin W. ’21 won the Virginia State Junior Varsity (JV) Championship in both the History Bowl and the History Bee. The History Bowl is a team event that Justin competed in solo against multi-person teams. The History Bee event is an individual event. Justin earned a spot to compete in the state competition by winning the Northern Virginia History Bee and Bowl JV Championship in January. Having won States, he will now compete in the 2019 Junior Varsity National Championship in Washington, DC, and Arlington, Va., on April 26-28. The National History Bee and Bowl are history quiz competitions for high, middle, and elementary school students that strive to promote history education. The Junior Varsity level is for grade 10 students and under. Go Red-Tailed Hawks! We are immensely proud of your hard work, dedication, and well-earned success!